HAT-TRICK HERO: Leeds United's Kemar Roofe, left, leaves with the match ball alongside Ronaldo Vieira. Picture by Bruce Rollinson. AFTER seeing Leeds United move seventh with Saturday’s win at Championship hosts Queens Park Rangers, Lee Sobot looks at a few talking points from the 3-1 triumph at Loftus Road. Roofe could hardly have done more to advertise his claims to be first-choice striker at Leeds after scoring a brilliant second-half hat-trick. But even in the absence of Hamburg loanee Pierre-Michel Lasogga with a calf injury, Roofe was only moved into the lone striker role in the 38th minute when Caleb Ekuban limped off with a foot injury allowing Roofe to be switched from out wide to upfront. The 24-year-old has always maintained that his best position is a striker and the former Oxford United player’s movement and finishing proved first class. 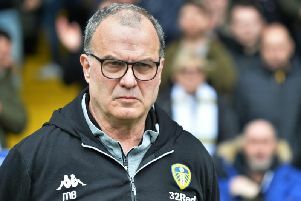 Ekuban will clearly now be facing a spell on the sidelines but Lasogga could well return to the squad in time for Saturday’s clash with Norwich City at Elland Road. But on Saturday’s evidence, the German will be looking at a place on the bench. Ekuban missed exactly three months of the season after breaking a bone in his foot during the 2-0 win at Sunderland in August. And in the aftermath of Saturday’s 3-1 win at Loftus Road, Whites head coach Thomas Christiansen admitted himself that he believed the striker had suffered a similar injury in the first half and Ekuban was on crutches and in a protective boot following the game’s conclusion. The 22-year-old is clearly going to be out for the immediate future and that leaves United with only three first team squad strikers in Roofe, Lasogga and Jay-Roy Grot who still looks short of what is required. The need for another striking option in January is pretty clear but there are other positions which United could also do with investing in. Will United look for a new ‘keeper in January? Chairman Andrea Radrizzani urged United’s fans to get behind their players after ‘keeper Felix Wiedwald not surprisingly copped a fair wedge of flak for his goalkeeping gaffe which set up a nervy conclusion that could and should have been avoided. Leeds would have been sick as parrots had the contest finished 2-2. In Wiedwald’s defence, the German did then produce a strong save to deny Idrissa Sylla what would have been the equaliser one minute later, a point alluded to by Radrizzani on social media. But Leeds and Wiedwald can ill afford such mishaps on a regularly basis and Wiedwald and Andy Lonergan have both blotted their copybooks too many times this season already. Whether Leeds bite the bullet or not and attempt to bring in another ‘keeper in January or stand by their men will be fascinating to see. The need for a natural left footed left back is also clear. The absence of Lasogga, Pablo Hernandez and Stuart Dallas through injuries was always going to open an avenue for somebody on the bench and Cibicki took his opportunity following the injury to Ekuban with both hands. The summer recruit from Malmo had previously featured only twice for Leeds this season - in EFL Cup games at Burnley and Leicester - but Cibicki’s Whites debut was one to remember with the 23-year-old causing plenty of problems on the right flank and delivering a fine cross for Roofe’s second goal. Cibicki will have a job keeping Hernandez and also for that matter Dallas out but Cibicki certainly impressed at Loftus Road and Christiansen has plenty of decent options as to who starts out wide.